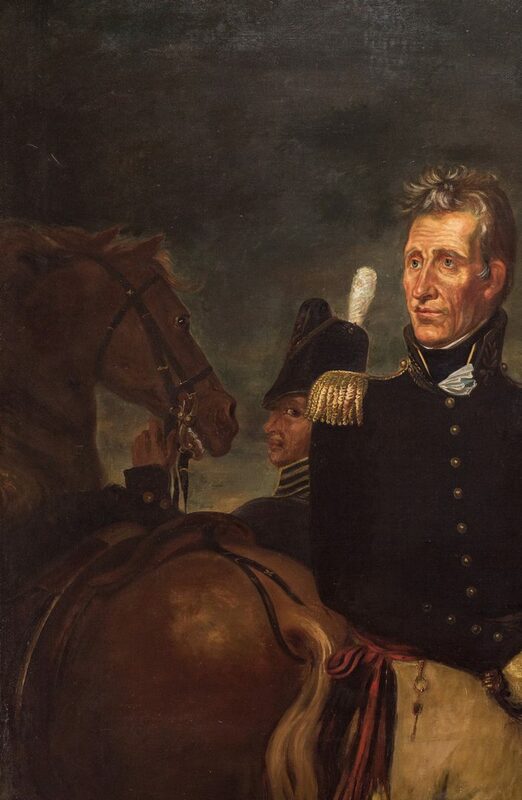 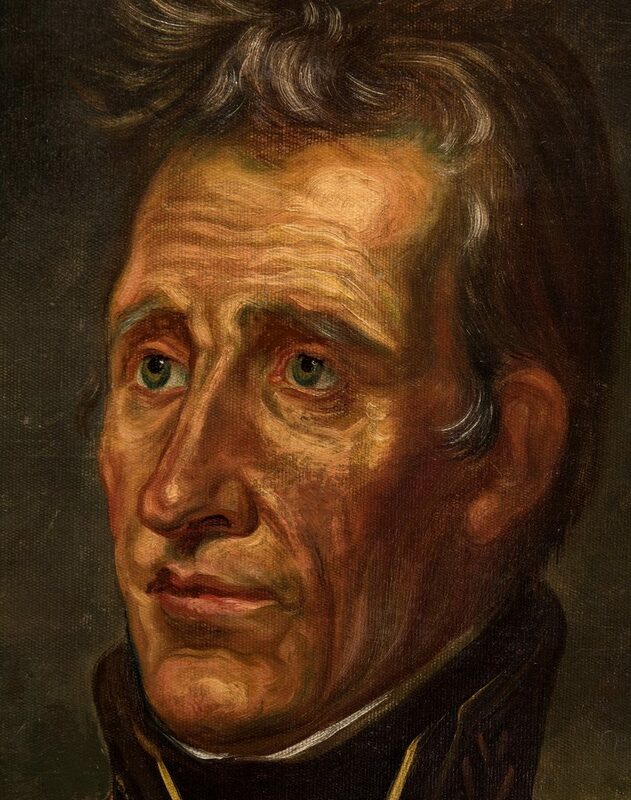 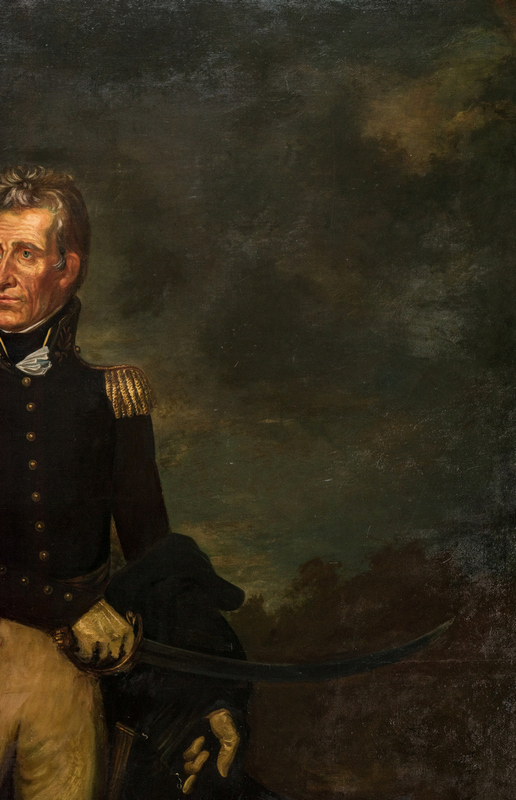 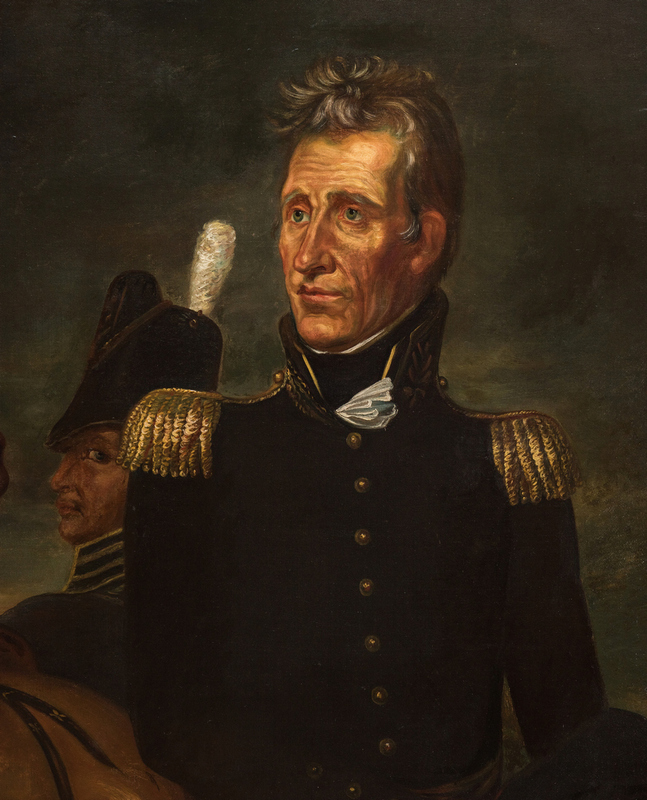 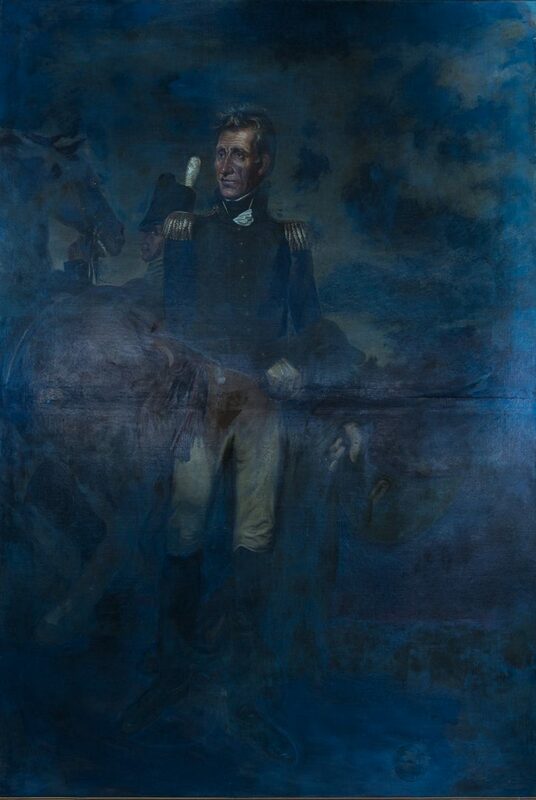 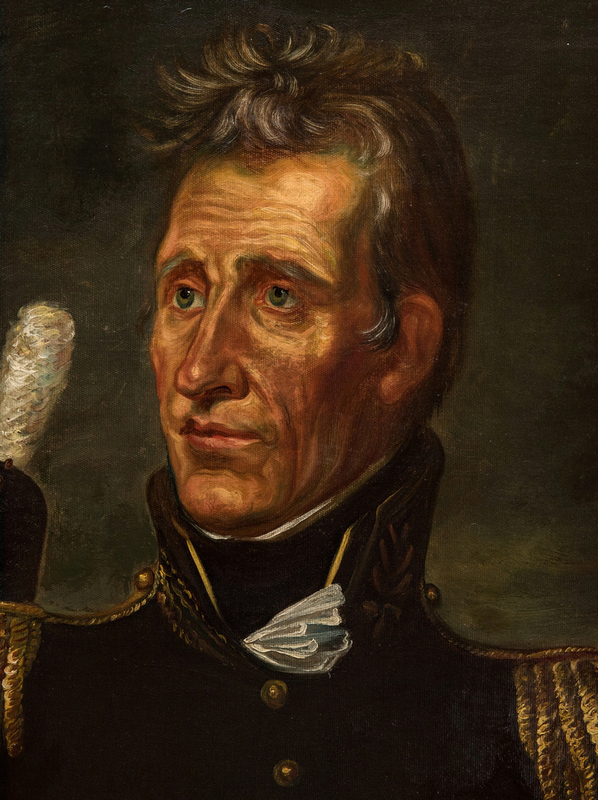 Large oil on canvas historical portrait of President Andrew Jackson (1767-1845), after the 1820 full-length portrait by John Vanderlyn. 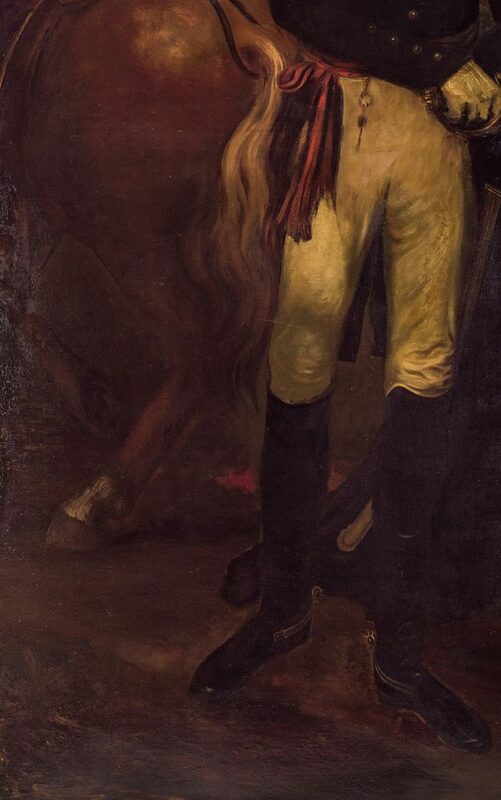 Attributed to historical genre painter Emanuel Gottlieb Leutze (District Of Columbia/New York/Germany, 1816-1868). 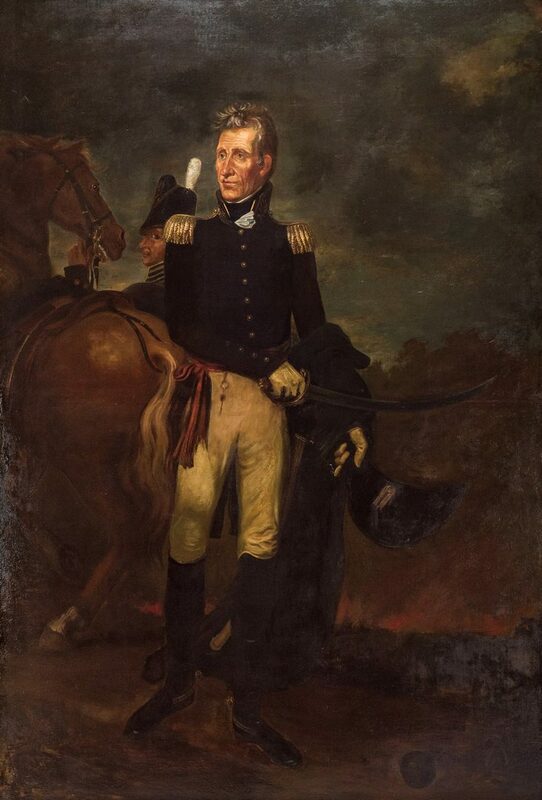 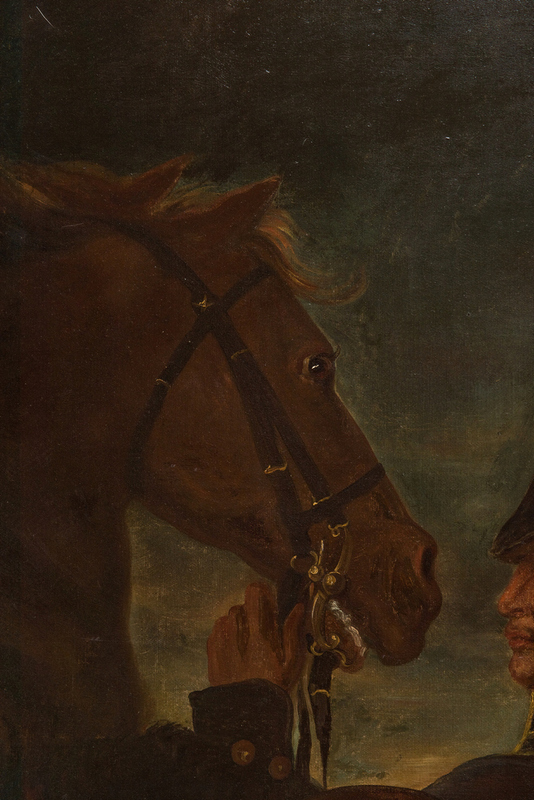 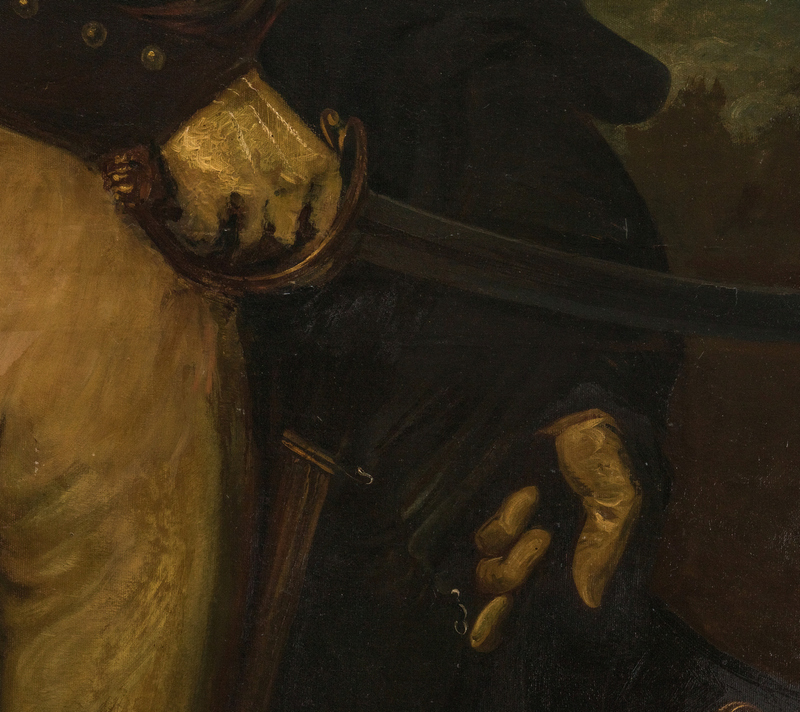 This life sized painting depicts Jackson on the battlefield (likely at New Orleans), attired in his military dress uniform, holding his sword in one hand and hat in the other, with his horse and fellow soldiers in the background. 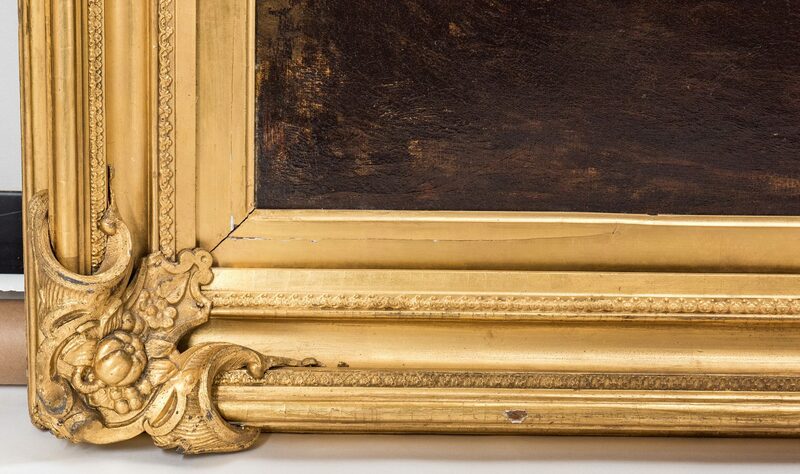 Housed in a carved cove style gilt wood frame with applied corner elements. 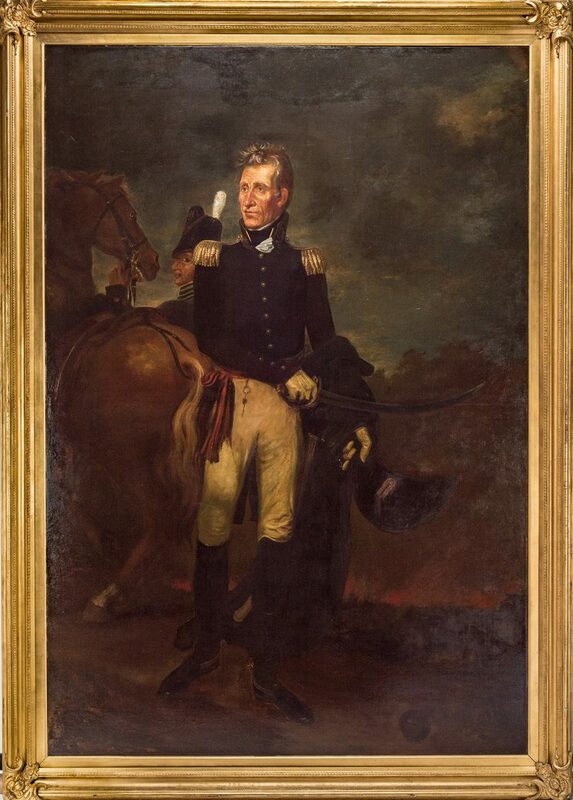 Sight – 94 3/4" H x 64 1/2" W. Framed – 106 1/2" H x 76 1/2" W. Provenance: private Tennessee collection, acquired at Freeman's Auction, Philadelphia, Nov. 13, 2013 Lot 267; Private Pennsylvania collection, acquired at Freeman's Auction, April 12, 2003, Lot 196; The Free Library of Philadelphia, where it hung for many years in Pepper Hall at the Central Branch; given to the Library March 2, 1931, by John Frederick Lewis, who acquired the portrait from the estate of Almira K. Schwenk. This painting came to the library with the tradition that it had been exhibited at the Centennial Exposition in 1876, although we have not been able to confirm this. 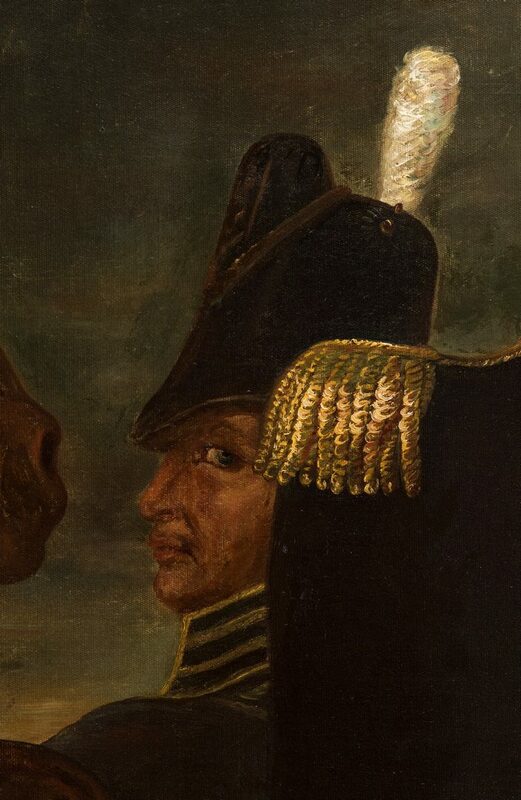 CONDITION: Canvas laid down on masonite, rubbing to left perimeter edge of canvas, numerous old repairs. 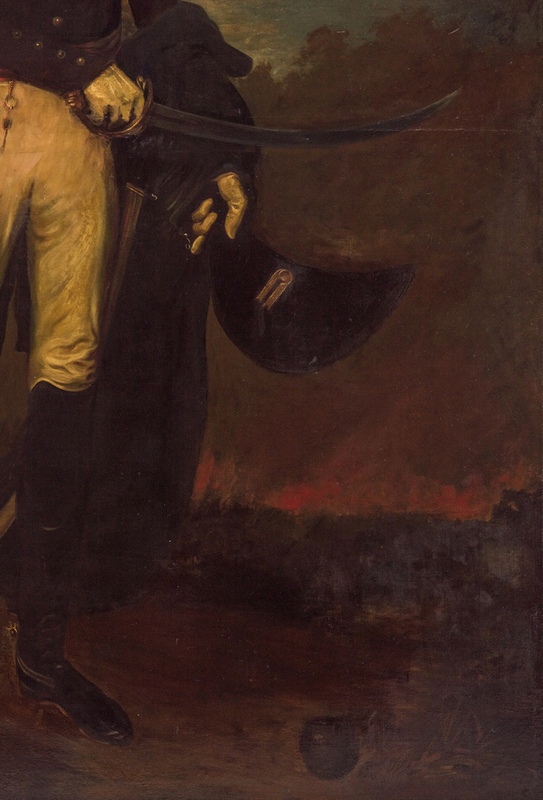 Blacklight reveals area of flourescence to several areas of background and to cheek, pant leg.